Preheat broiler. For chutney, combine water, cranberries, apricots, fruit spread, vinegar, cinnamon, and 1/8 teaspoon salt in medium saucepan; bring to a boil over high heat. Reduce heat to medium-low; simmer, uncovered, 12 minutes or until mixture is thickened. Remove from heat; stir in pear and vanilla. Rub both sides of lamb chops with garlic. Sprinkle with remaining 1/4 teaspoon salt, rosemary, and pepper. 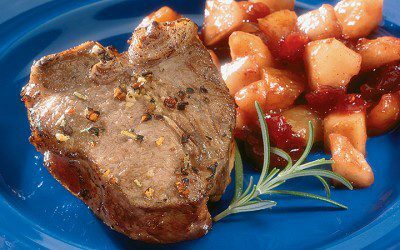 Coat broiler pan and rack with nonstick cooking spray; arrange lamb chops on prepared rack. Broil lamb at least 5 inches from heat source 7 minutes. Turn and broil 7 minutes more or until desired doneness. Serve lamb chops with chutney. Serving size: 1 lamb chop with 1/4 cup chutney.